It seems that BBQing is still a man’s domain. Men are expected to turn the snags at the family do. Don’t get in their way. After years on the grill in restaurants managing to juggle a multitude of orders for different meals cooked to order, I am still treated like an interloper if I offer to wield the tongs at a BBQ. Even though I am sure I can BBQ much better than most male people I know, I feel like I’ve entered the wrong locker-room and duly scuttle back off to the kitchen with the women. Despite loving to grill we don’t have a BBQ at our house, and Skater and I often stop by the shops to look at all the BBQ’s. Its a strange thing that my son, who is not so interested in food really loves the whole idea of a BBQ. It could be the natural lure of the mens business, I am not sure, but on a trip to the Supa Centa to get a new printer on the weekend we took a detour past Barbecues Galore, the BBQ store . 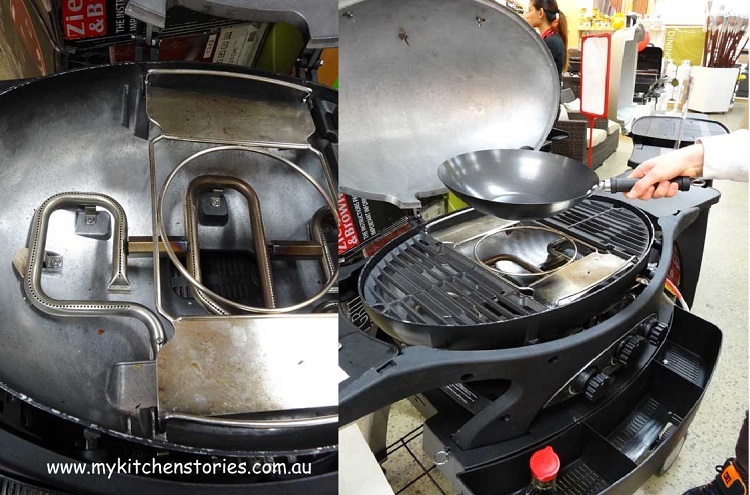 Once inside the store we marvelled at the wok burner on the side, monster- sized BBQ’s and oo-ed over the large lidded grills. When a salesman sidled up and we started to chat. He suggested we should look at the Ziegler and Brown or the “Ziggy” – “Because if you guys don’t have much room and you live in a rental house, it’s easy to move anywhere you go.” So, even before we were able to tell him we were really just dreaming, he proceeded to give us the run down on the Ziggy. It looks a bit like that famous brand of flip top BBQ’s that have been around forever. So I asked what the difference is and apparently it’s all about the burners and the high dome. This Ziggy is designed to cook perfectly with the lid up or down because there is more burner coverage, more heat in the double or triple burner. The salesman suggested using them together for high heat or independently for a gentle heat or when there’s just one or two people. He went on to tell me how he bought one on special and that he bakes and roasts and even makes pizzas in his………..all the while he talked to my son, who was exclaiming superlatives like…awesome & cool & sick. They bonded over the flame thrower on each burner……….did I tell you that this was all directed to my son, kind of like I’d walked up to a group of men barbecuing in the park. Secret BBQing business. That is when I told him that we were just dreaming. We left the shop to go and get our printer chatting about where we’ll put our Ziggy one day. I got home and still dreaming, thought of what I could make. I wanted a recipe that was all about the thrill of the grill, that used the idea of the lid, and the smokey chary flat grill. 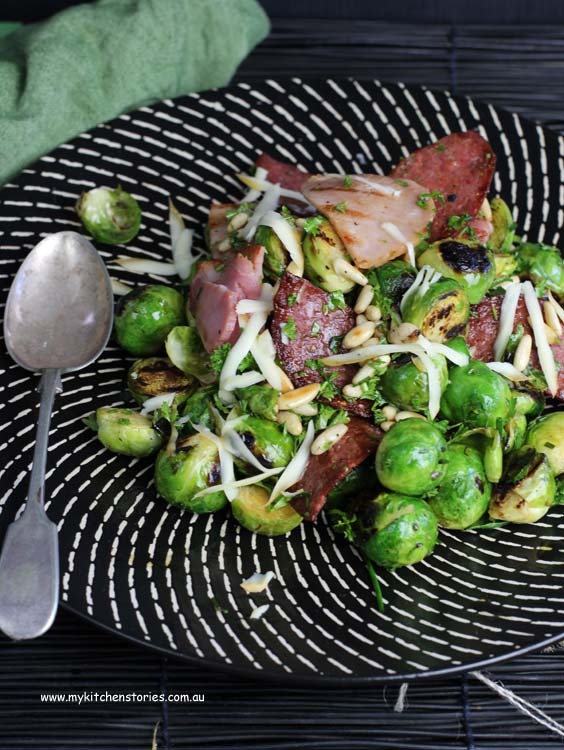 I came up with this warm BBQ Brussels Sprouts, Grilled Salami, Smoked Mozzarella Salad. If you don’t like sprouts you can use cauliflower or potatoes or even fennel. Prepare all of the other ingredients before you start. The chopped parsley, chopped chives, toasted pinenuts, 1/2'd salami and bacon pieces, grated mozzarella . Take a large bowl and add the trimmed sprouts, salt pepper and 40 ml olive oil and toss to coat. Heat a flat BBQ plate till very hot, then turn down to medium. Lay all of the salami and bacon pieces on the grill. Turn after 1 minute and brown up the other side before taking off the grill and putting on a plate. 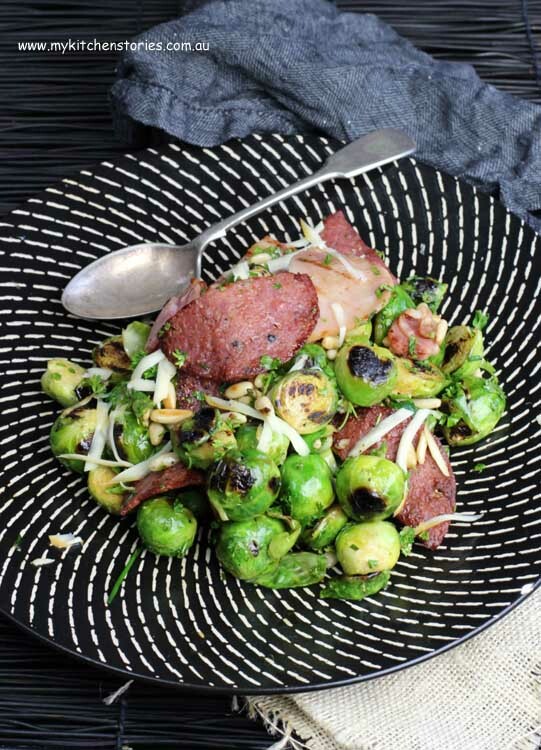 Put the sprouts on the the grill and turn every couple of minutes, cooking and charring on all sides, put the lid down. The temperature will rise to about 200C between each time you move them around approximately 10 minutes. Test the sprouts with the tip of a knife and when the knife pierces easily they should be done. 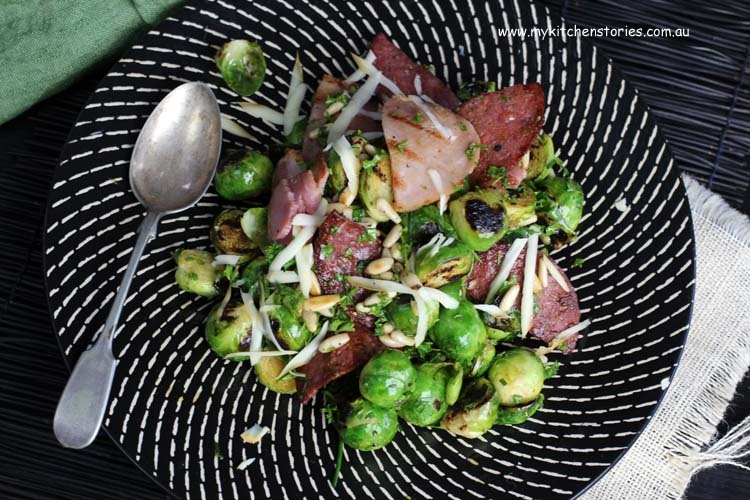 Scoop all of the sprouts back into the bowl and add the salami, bacon, parsley, chives & nuts. Mix together. Dress very simply with the balsamic and extra olive oil. Add a grind of fresh pepper and taste it for salt, add more if necessary . Put onto a plate and sprinkle with the smoked grated mozzarella. 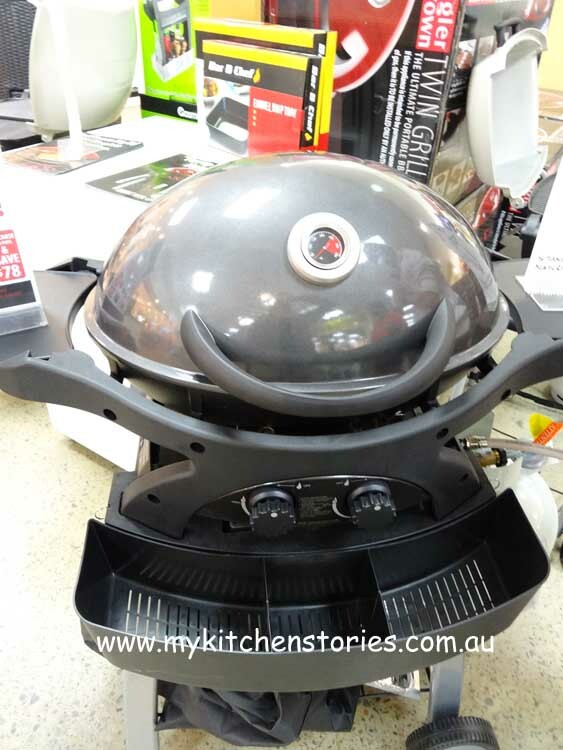 Looks like a little robot….Ziggy is exclusive to Barbeques galore. One day Ziggy, one day.. This post was sponsored by Ziegler and Brown and I still wish I had one. Have often thought about getting a bbq too. All that smoky charred goodness that could be mine! The mozzerella sounds great on this dish! Love this post. I’m glad you have to come back to the kitchen during bbqs though cause that means I get to spend more time with you! I think you could do a lot with Ziggy – more than DD with his humongous bbq haha. 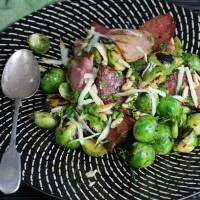 The brussel sprouts in this recipe look yummy, as does the mozzarella. I love the look of Ziggy and need to buy a BBQ soon – think I will take a look at Ziggy! Recipe looks really fab too! I want a Ziggy too! I want a new camera first so Zig’s gonna have to wait. I love the dish, Tania. You’s a clever cookie! Lovely dish, and the BBQ flavors look divine. I can devour the whole plate in no time. the grill is my best friend of late, and i would love this! !